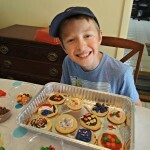 Painting Creative Roots Mosaic Stepping Stones To Brighten Up Our Yard! A special thank you goes out to the Horizon Group USA for sending my family Creative Roots Mosaic Stepping Stones to review. Opinions expressed are that of my own. Finding hands on activities appropriate for all 3 of my kids can be difficult, especially with a kindergartner, 4th Grader, and 7th Grader. However when it comes to painting kits, I find that they work out great because each child can decorate at their own level. 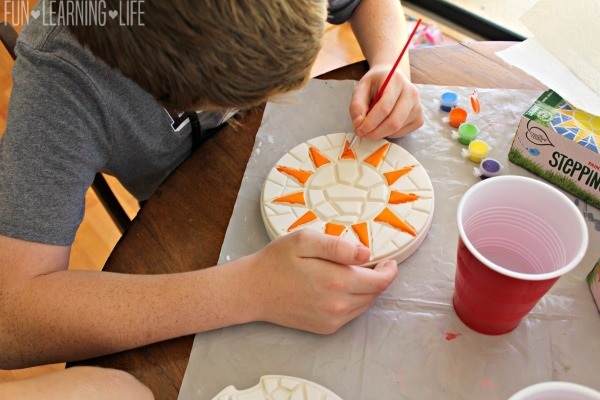 When I saw that Horizon Group USA had the Creative Roots Mosaic Stepping Stones, I was excited to check them out and have the kiddos put them to the test. 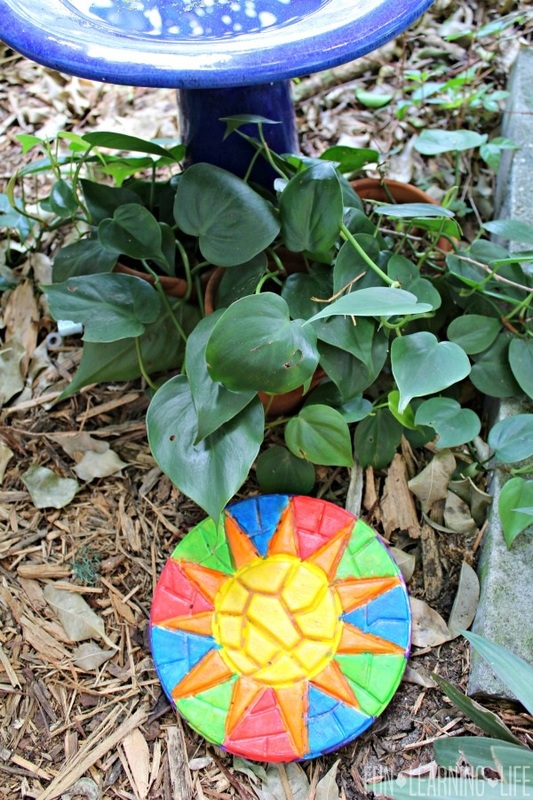 Plus these Mosaic Stepping Stones were ideal for our home, since I had been weeding and working on various beds around the yard during the summer. Each set comes with a paint brush, 6 types of paint, and of course the unpainted Mosaic Stepping Stone. I handed these over and my kiddos got creative as well as took their time, spending 2 days working on their projects. Plus, I figured there was no rush and this would keep them occupied a little longer. Tip: Have your child wear an apron or clothes that can get paint on them and put down a cover, like newspaper to protect surfaces. After they were completely dry, we found a spot for them in the beds around the house. Tip: These are for decorative purposes only and would not suggest actually stepping on them. Do your children or children in your family like to paint? 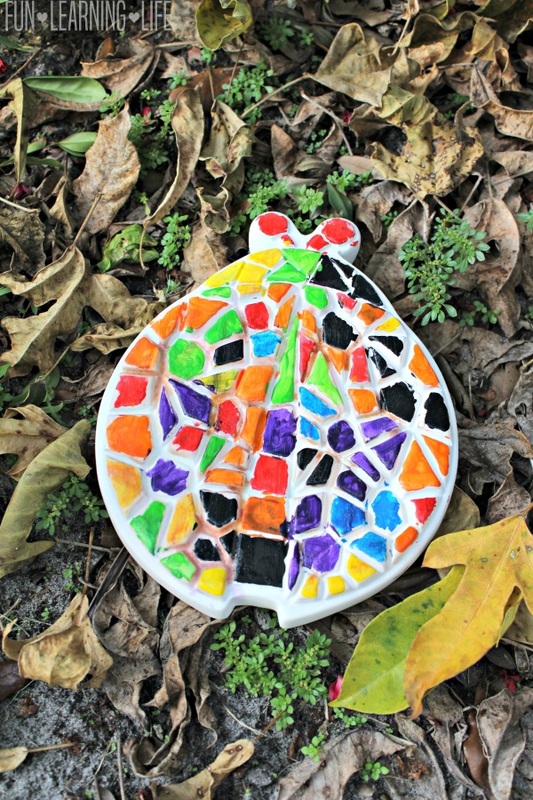 Who would you gift a Mosaic Stepping Stone to? 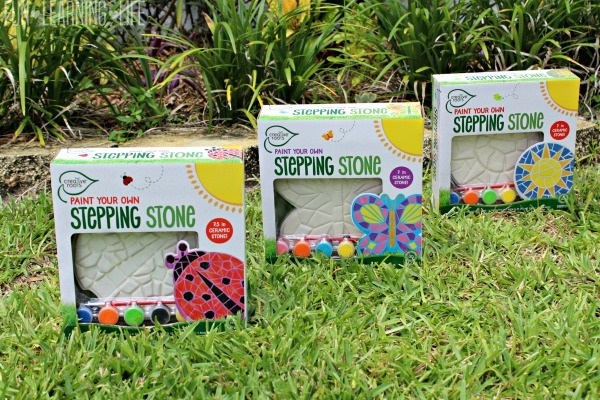 Look for these kits in 3 designs including Butterfly Stepping Stone, Sun Stepping Stone, and a Ladybug Stepping Stone, for the suggested retail price of $7.99. 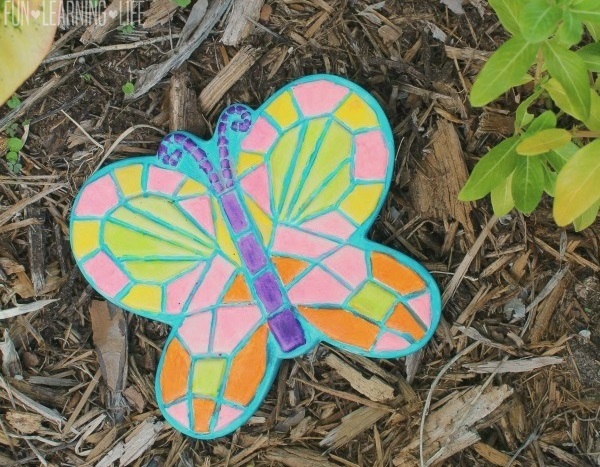 I think these Mosaic Stepping Stones would make an awesome gift for kids and would be fun for families to work on together. Thanks to Horizon Group USA, I have been authorized to giveaway Mosaic Stepping Stones to Three (3) Lucky Fun Learning Life Readers! * Participants must be 18 years or older to participate and live in the contiguous United States. Odds are based on the number of entries, and by participating, you agree to these terms and the laws set forth by your individual state. Entries will only be accepted through the Rafflecopter Form, and the website is not responsible for disruption of the page or service which could cause problems with entering. The winner will be contacted through email (make sure you check your spam or junk mail) with the Subject line “Winner of a Creative Roots Mosaic Stepping Stone!”. Shipping information, including email, phone, and address will be collected at that time. The winner has 48 hours to respond, after that an alternate will be chosen, and so on and so forth. This website does not sell personal information. The prize will be fulfilled by the sponsor. This website does not share information with 3rd parties unless specifically expressed in a specific promotion or giveaway. This giveaway is not associated, nor sponsored by Facebook. 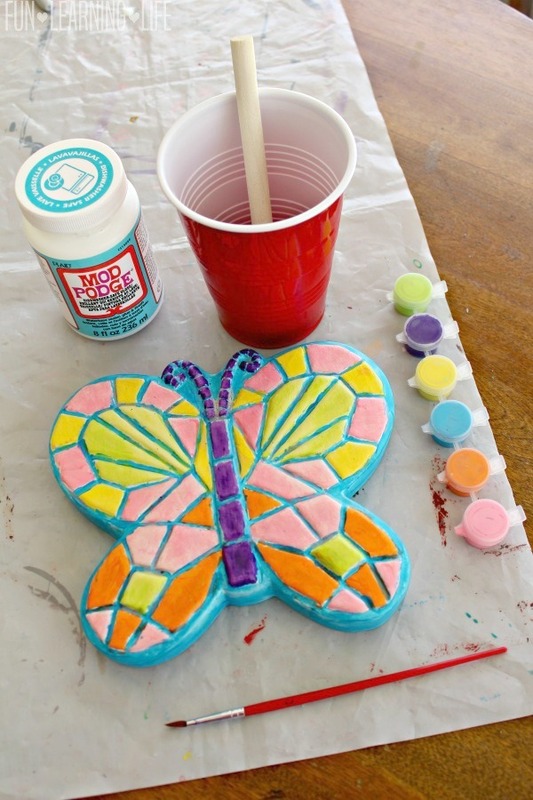 Look What My Daughter Can Do With The No Spill Paint-Sation Art Kit! 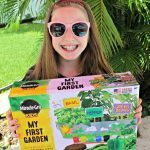 Summer Craft Idea, Miracle-Gro Kids My First Garden Kit! 5 Summer Playdate Ideas With Planning Tips! Perfect for a garden or grandparent. My daughter loves to paint and we would keep this for our garden. I'd gift this to my goddaughter. She loves painting and all kinds of fun projects and this looks like something we could have fun doing together. We love to paint. This would be for the granddaughters. The grandkids do like to paint. I would let each grandchild paint a little. My granddaughter likes to paint -- I would give this to her if I'm the lucky winner. I would probably keep it for myself as I like doing things like this. 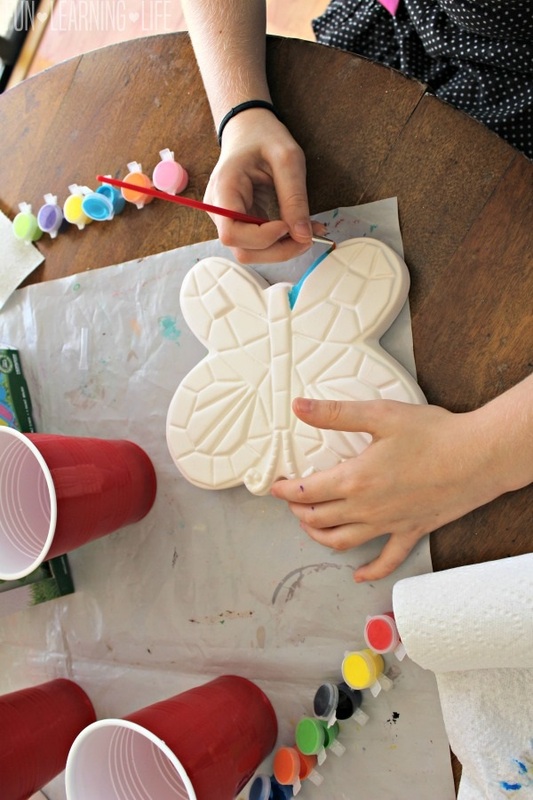 Love to have crafts on hand for my grandkids to do. This would be great. Thanks for the chance to win. Yes, my daughter likes to paint. I would gift this to my daughter. This would be a piece of art that all the kids could put their own twist on it - and a great stepping stone for our front walkway. I would have each of the grandchildren take their turn so they all have a part of this great activity. My kids love making things like this and their grandparents display them proudly. They love handmade gifts. My niece love to paint! This will be perfect for her! I would win this for my niece who loves to paint and draw. My son doesn't really like to paint. If I win, I would give this to my niece who loves to paint. Yes, My son loves to paint. He would love this! How perfect for our garden. We love crafts and we would love this one. All 0f our kids LOVE to paint. Our 3 year old and 7 year old daughters do expecially love to paint! My daughter loves to paint and I would give this to her. My daughters love to paint! They are 3 and 7! Yes my kids and I like to paint . I would give this to my daughter. My son would enjoy painting these. It looks like a fun project that you get to keep and enjoy placing in your garden. My daughter loves to paint and so do I! We'd have fun doing this together. My three boys would love this. They like painting and crafts. Would be fun to put in our flower bed. I would love to win this for my daughter! 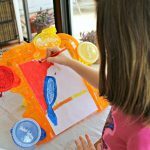 She is super crafty and would love this project! my kids love to paint. they are big fans. My son loves to paint. It would be a gift for him. My granddaughter would really enjoy these. They would be so beautiful in my rock garden. The little ones do! We have painted rocks. My son loves to paint. I would give this to him. I'd give to my friend's daughter. She loves to paint. My son likes to paint. He likes to do anything creative. He would love to paint one of these to give to his grandmother for her yard. 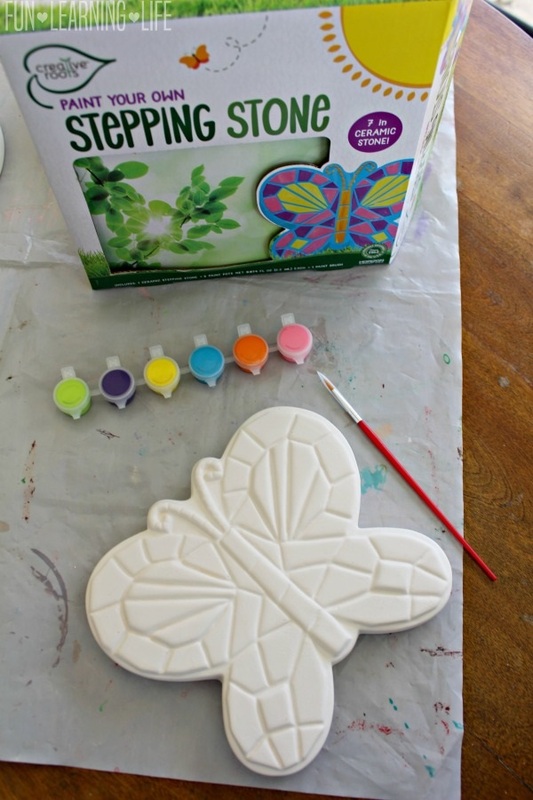 All of my kids love arts and crafts to include painting; any one of them and I would love the stepping stone craft. My kids love to paint. I would like this for them. My daughter would love this! She could paint for hours. My daughter loves to paint. She would love this. We would paint the stepping stone and give it to my aunt, who would put it in her garden. My littles love to paint. If I win, this would go to the oldest because the youngest is still too little to paint. He tries to eat everything! I have no children in my home but my grandchild likes to paint so I would give it to her.